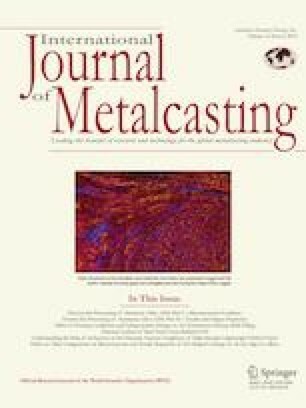 In this study, an in situ Al–20%Mg2Si composite fabricated with varying levels of cerium (Ce) as an inoculation was investigated. Microstructural examinations were carried out via scanning electron microscope and X-ray diffraction. The results showed that Ce inoculation changed the morphology of primary Mg2Si from coarse lotus-type particles to fine polyhedral shape. Furthermore, the average size of primary Mg2Si particles decreased obviously. When the Ce addition reached to 0.6%, the refinement of Al–20%Mg2Si composite was the best. Similarly, the superior ultimate tensile stress, elongation at fracture (%El), and Vicker’s hardness (Hv) of Al–20%Mg2Si composite were obtained. However, excess Ce inoculation addition reduced refinement and mechanical properties because of Al11Ce3 phase aggregating. The intermetallic compound Mg2Si exhibits high melting point (1085 °C), low density (1.99 × 103 kg * m−3), high hardness (4.5 × 109 N * m−2), low coefficient of thermal expansion (7.5 × 10−6 K−1), and reasonably high elastic modulus (120 GPa).1, 2, 3 However, the main disadvantage of Mg2Si is severe brittleness which makes its processing and application hard, especially at low temperatures.4 When Mg2Si is embedded in ductile Al matrix, the Al–Mg2Si composites, which are widely used as structural materials in many fields with a combination of properties of both Mg2Si and Al, are obtained.5,6 However, the phase of Mg2Si in composites showed a low ductility because of the large Mg2Si particle size and the brittle eutectic matrix.7,8 Thus, in order to improve the overall mechanical properties, the primary Mg2Si particles in aluminum metal matrix composites must be modified to change their morphology and distribution. Rare earth (RE) elements such as Y,9,10 La,11,12 Nd,13,14 and Pr15 can effectively refine the structure in different components of Al–Mg2Si composites. Consequently, the structural modification by adding RE is one of the most effective methods for enhancing strength and ductility of the Al–Mg2Si composites. However, there have been few reports on the effect of cerium (Ce) inoculation on Al–Mg2Si composites. In particular, the mechanisms of Ce inoculation on Mg2Si phase in Al–Mg2Si composites have not yet been explored in depth. In the present work, Ce as a new kind of inoculation is adopted to modify primary Mg2Si particles aimed to investigate the effect of Ce on microstructures and mechanical properties in Al–20%Mg2Si metal matrix composite prepared by in situ process. 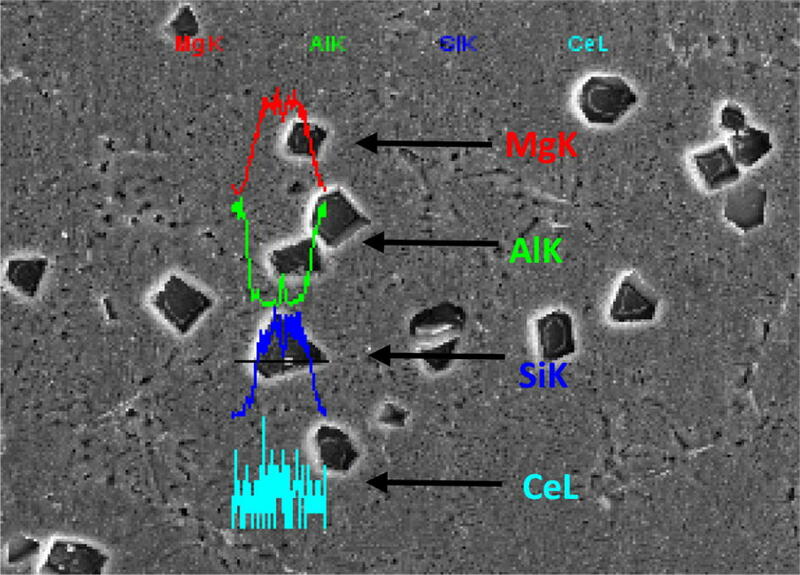 Even more, the mechanisms of Ce inoculation on Mg2Si phase in Al–Mg2Si composites are investigated. Starting materials used in the experiment, commercially pure aluminum (ingot, 99.70% purity), magnesium (ingot, 99.61% purity), and silicon (Al–26%Si alloy), were accurately weighed in stoichiometric proportion (all the compositions given in this paper are in wt% unless otherwise stated), which corresponds to a composition of Al–20%Mg2Si. In addition, Al–Ce (1:1) alloy was refined at different mass fractions, such as 0.4%, 0.6%, 0.8%, 1.0%. The prepared starting materials were melted in a high-temperature resistance furnace. Mg was added into the melt with an extra of 20% of the target composite in order to balance the oxidation loss. The amount of the extra Mg was determined, based on our previous experiment of casting such composites.16 The parent alloy was heated to 720 °C to melt the composite, and the Ce was added into the solution. A salt mixture of NaCl–KCl (1:1) in powder form covered the top of the molten alloy to prevent Mg from being lost into the atmosphere during the melting. The solution was kept for 10 min for homogenization. Degassing was conducted by using C2Cl6 powder with a purity of 99.9%, which was added at 0.4% of the molten alloy. The melt was degassed for 5 min before casting. After removing the slag, the melt was brought to 720 °C and was cast into a room-temperature (RT) graphite mold creating the composite ingot. The mold is a cylinder, which is 70 mm in inside diameter and 110 mm in depth. In order to verify the validity of the results, each ingot composition was cast three times. All the microstructure and hardness specimens were cut from the same positions of the ingot at 10 mm from the bottom of the casting. The specimens were mechanically ground and then polished using standard metallographic techniques. Each cross section was etched using 5 vol% hydrofluoric acid (HF) water solution. The microstructures of the composites were observed by a scanning electron microscopy (SEM). The phase constitution was carried out using X-ray diffraction equipment (XRD). Vicker’s hardness (Hv) was examined by digital microhardness tester at room temperature. Five tensile test specimens are cut by wire electrical discharge machining. Then, the ultimate tensile stress (UTS) and elongation at fracture (%El) were tested by the hydraulic universal tester. The average values of UTS, %El, and Hv were calculated after deleting the maximum and minimum. where subscripts E represents eutectic, P represents primary phase, and L1 is a liquid in two-phase region. Equilibrium pseudo-binary Al–Mg2Si phase diagram. Typical SEM diagram and energy-dispersive spectrometer (EDS) analysis of Al–20%Mg2Si composite without Ce inoculation are shown in Figure 2. The dark, bulky, herringbone, and lotus-type particles (Figure 2a) are primary Mg2Si phase, and the gray microstructure (Figure 2b) is α-Al phase. It is shown that primary Mg2Si particles are irregular and polymorphic, and the particle size reaches up to ~ 142 μm. 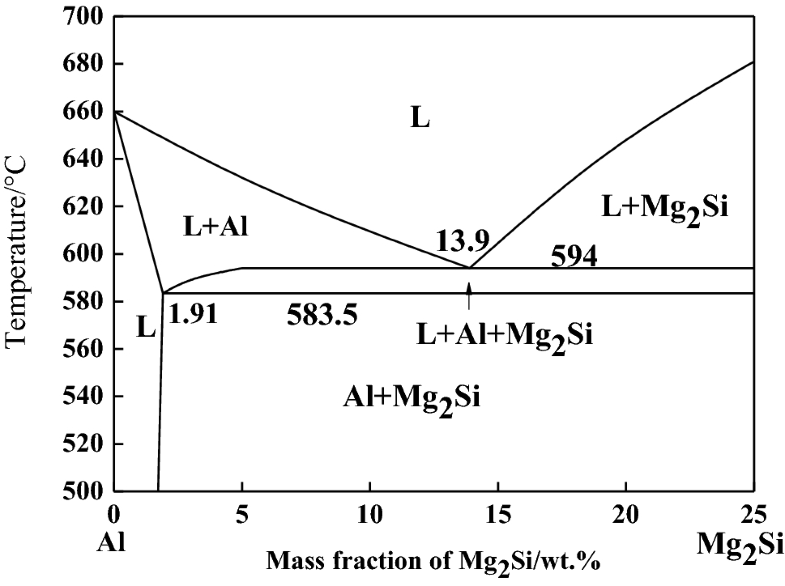 According to atom mass, the mass ratio of Mg–Si in Mg2Si intermetallic is 1.73. The result in Figure 2a shows that there is little aluminum in the dark phase and that the mass ratio of Mg–Si is 1.729, which indicates that the dark region is primary Mg2Si phase. Further, testing results in Figure 2b indicates that the gray phase is α-Al phase. SEM micrograph and EDS analysis of Al–20%Mg2Si composites without Ce inoculation. Microstructures of Al–20%Mg2Si composite with different additions of Ce inoculation are compared in Figure 3a–d. When addition of Ce inoculation is 0.4% content, the microstructure is shown in Figure 3a. 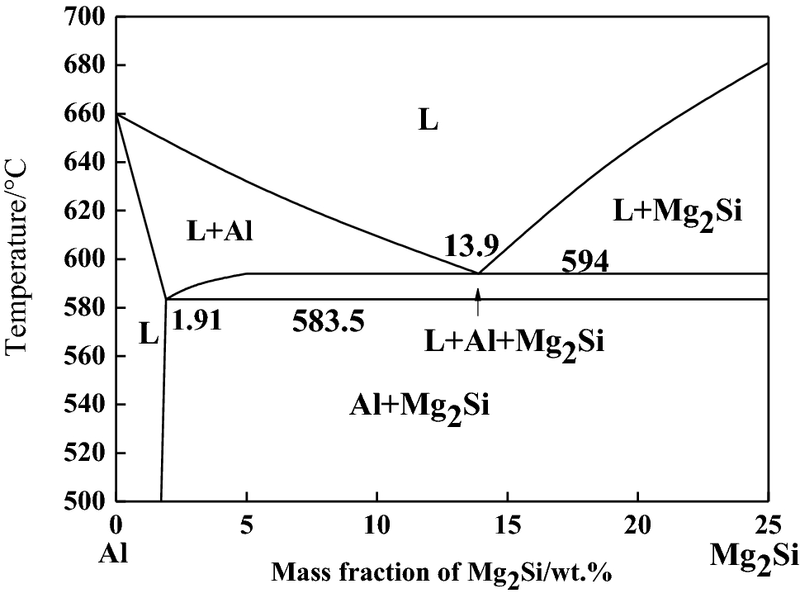 The primary Mg2Si phase is refined and the average particle size is about 31 μm. The herringbone and lotus-type particles are vanished, and the particle size is largely decreased. 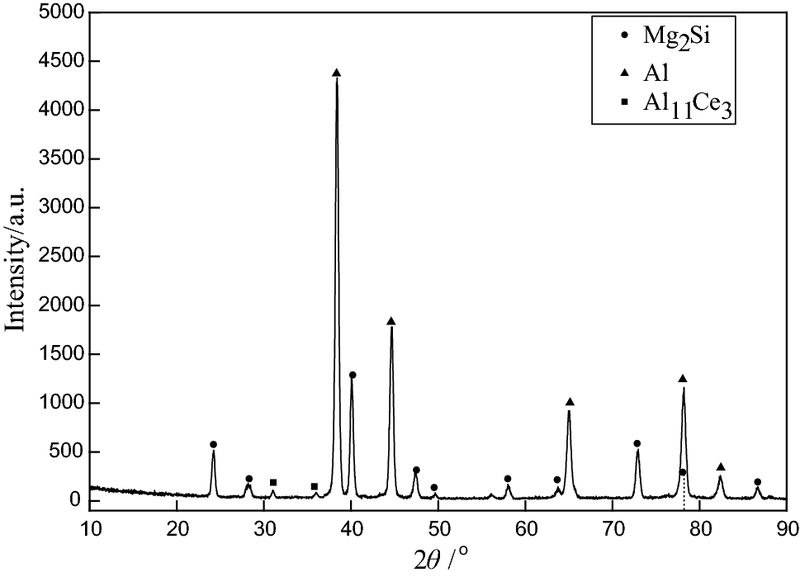 When the Ce addition reaches to 0.6%, as shown in Figure 3b, the size of primary Mg2Si phase is much smaller, the number density is higher, and the distribution is much more homogeneous. The average size of Mg2Si particle is less than 24 μm. However, when the Ce addition is 0.8%, the refinement in Figure 3c is not as good as that in Figure 3b. The average particle size of the primary Mg2Si is 38 μm. Even the inoculation has little effect, when the Ce reaches 1.0%. The primary Mg2Si phase changes bulky and lotus-type particles emerge again. In conclusion, Ce inoculation can refine primary Mg2Si phase of Al–20%Mg2Si composite effectively, and the refinement is best when the Ce addition reaches to 0.6%. 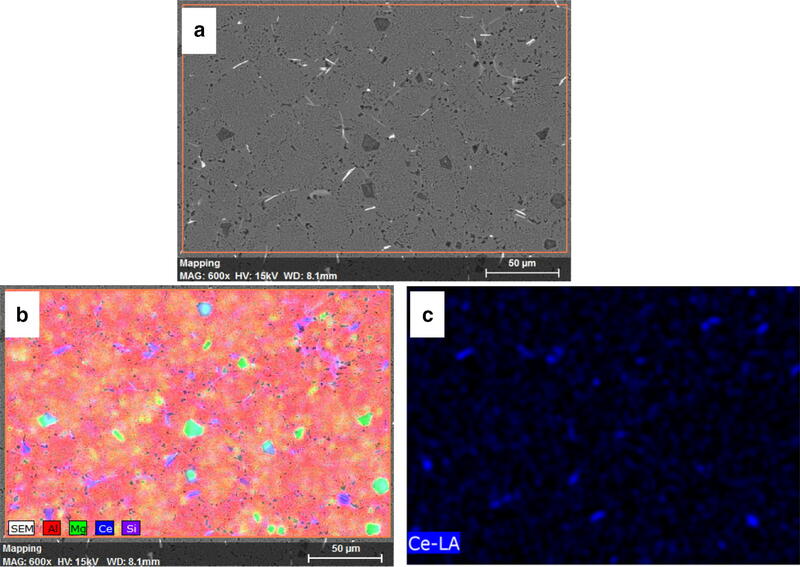 Microstructures of Al–20%Mg2Si composite with different additions of Ce (a 0.4%; b 0.6%; c 0.8%; d 1.0%). 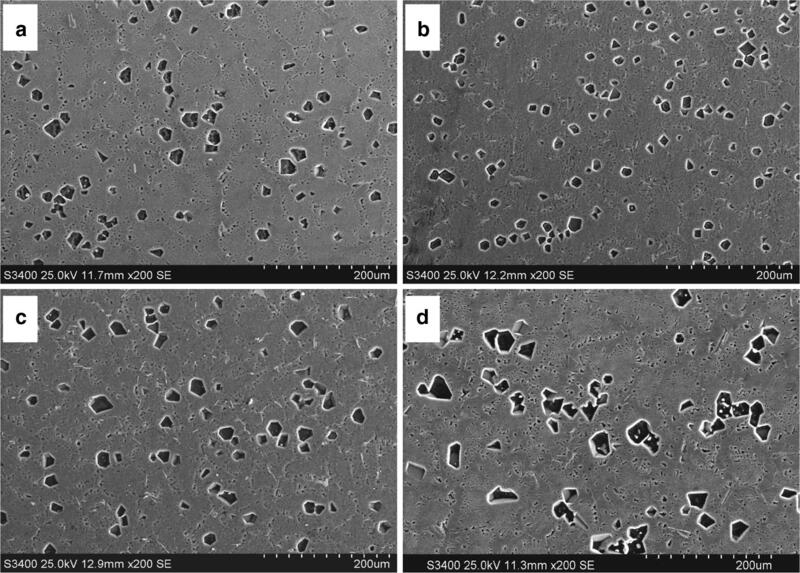 The regulation of mechanical properties of Al–20%Mg2Si composite with different addition of Ce inoculation is presented in Figure 4. With increase in Ce additions, all the mechanical properties of composite, such as UTS, %El, and Hv, firstly increase and then decrease. Mechanical properties of Al–20%Mg2Si composite with different additions of Ce inoculation (a UTS; b %El; c Hv). The testing results in Figure 4 indicate that when the Ce addition is 0.4%, the UTS and %El increase immediately, and Hv increases a little slowly. When the Ce addition reaches 0.6%, all the mechanical properties reach to maximum. The UTS changes from 140.6 to 188.9 MPa, increasing the percentage of 34.4%. The %El changes from 2.75 to 3.55%, approximately 29.1% increment. The Hv changes from 96.8 to 118.2 HB, which is about 1.22 times higher than that of unmodified composite. When the content of Ce increases from 0.6 to 1.0%, all the mechanical properties decrease. Comparing strength and ductility with microstructure in Figure 3, the variation trend of mechanical properties is the same as microstructure. It is evident that the refinement in the particles size of primary Mg2Si has a significant influence on tensile properties of the composite. If the microstructure is modified effectively in the metal solidification processing, there are two possible basic ways: First, the way to refine the grain is restraining grain growth and changing the way grain grow. Second, the crystal grain is refined by increasing the quantity of crystal nucleus. The two modifying effects can be fulfilled at the same time by adding a small amount of rare earth (RE) elements, to produce a refined microstructure. In order to obtain the mechanism of Ce inoculation on Al–20%Mg2Si, Mg2Si phase and the surrounding should be detected by using EDS line scan when the Ce addition reaches to 0.6 wt%. As shown in Figure 5, elemental Ce or Ce compound are distributed inside primary Mg2Si particles, and Ce levels multiply interface between α-Al phase and Mg2Si phase. EDS line scan suggests that both modification mechanisms are working. EDS line scan of Al–20%Mg2Si composite with 0.6% Ce inoculation addition. RE Ce has a higher melting point at a temperature of 798 °C, which will hinder dissolving in the melt, than the liquidus (665 °C) of primary Mg2Si. In addition, crystal structures of elemental Ce and Mg2Si are similar, both of which belong to space group of Fm3m. It indicates that the high melting point and high similarity of Ce inoculation can act as heterogeneous nucleation sites for the primary phase Mg2Si during initial stage of solidification. As stated by Chang et al.,18 RE is a surface active element; it is easily segregated on the solid–liquid interface, or adsorbed on the front of crystal growth, changing the solid–liquid interface energy and the crystal surface energy. Mg2Si particle refined by Ce inoculation is related to the composition supercooling caused by the segregation of Ce in the melt in the front of the solid/liquid interface of Mg2Si during solidification. Ce is easy to enrich at the growing interface of Mg2Si due to extremely low solidity of Ce in the Al matrix, which increases the local composition supercooling. With the increase in Ce concentration in the melt, the effect of composition supercooling increases. When the Ce concentration rises to a certain extent, Ce has no time to diffuse into liquid phase because melt alloy cooling speed is very fast during alloy solidification process, which results in forming enrichment layer of Ce before the interface advancing and restrains the growth of Mg2Si phase. In addition, with Ce addition, some lattice distortion in Mg2Si is formed because of high solidity limitation of Ce in Mg2Si and larger radius of Ce atom. Therefore, the surface energy of the Mg2Si crystals is changed, and the anisotropic growth of the Mg2Si is restrained with Ce addition. However, primary Mg2Si particles coarsen when the Ce addition increases from 0.6 to 1.0%, as shown in Figure 3b–d. This phenomenon caused by excess Ce addition may be due to forming some Ce compound which decreases the refinement effect of Ce inoculation. As shown in Figure 6, there are some white particles emerging in microstructure of Al–20%Mg2Si composite. According to detection of EDS map scanning, it is confirmed that white particles is Ce compound. XRD results in Figure 7 show that Ce compound is identified as Al11Ce3. (a) The area of EDS map scanning; (b) kinds of related elements; and (c) distribution of Ce element of Al–20%Mg2Si composite with 1.0% Ce inoculation addition. XRD of Al–20%Mg2Si with 1.0% Ce inoculation addition. Al11Ce3 crystal has an orthorhombic structure with the lattice parameters a = 4.426 nm, b = 13.116 nm, and c = 10.162 nm. It proves that Al11Ce3 is hard to meet the character of heterogeneous nucleation sites. 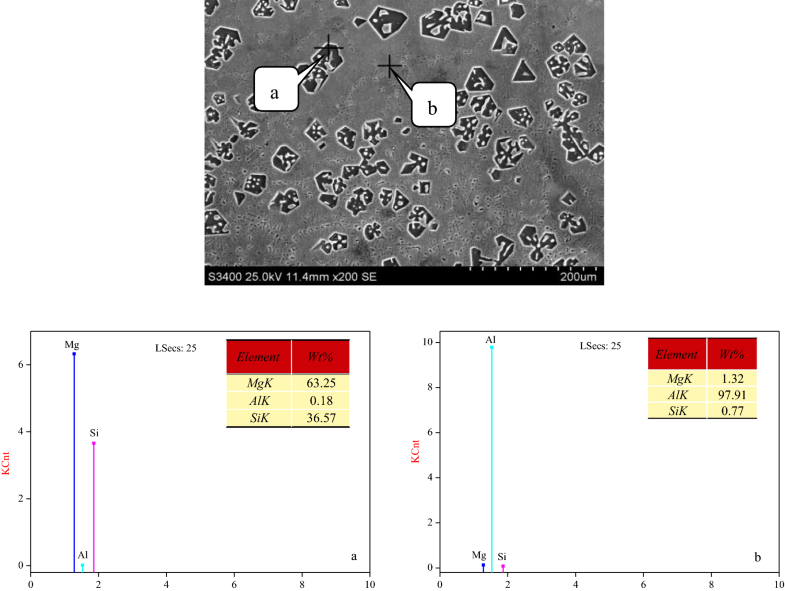 In addition, EDS map scanning analysis in Figure 6 indicates that Al11Ce3 phase get together to forming Al11Ce3 crystalline particles rather than segregating in the front of the solid/liquid interface to hinder grain growth. Thus, refinement of Ce inoculation decreases when the Ce addition reaches to 1.0 wt%. With Ce inoculation increasing, Al11Ce3 phase and dissociative elemental Ce increase. When concentration of dissociative elemental Ce in the melt reaches to saturation, more Al11Ce3 phases emerge. 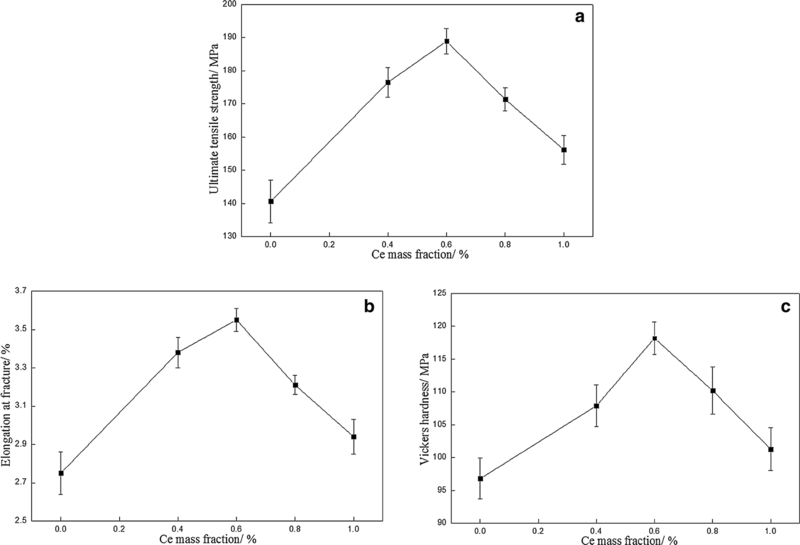 Refinement of Ce inoculation decreases when the Ce addition reaches to 1.0%. The effect of different Ce inoculation on the microstructure and mechanical properties of Al–20%Mg2Si composite is studied and the following conclusions can be drawn. Ce inoculation can refine primary Mg2Si phase. When the Ce addition reaches to 0.6%, the refinement on primary Mg2Si phase in Al–20%Mg2Si composite is the best. The primary Mg2Si particles size is the smallest; the particles quantity is the most, and the distribution is the most homogeneous. Excess Ce inoculation addition reduces refinement because of Al11Ce3 phase aggregating. The variation trend of mechanical properties is same as microstructure, all the mechanical properties of composite, such as UTS, %El, and Hv, firstly increased and then decreased. The funding was provided by Science and Technology Projects of Education Department of Liaoning (Grant No. LGD2016017).